Get rid of those nasty fleas the healthy, natural way with this flea repellent for home! Making a homemade flea killer for your home is so easy and convenient, using just a few simple, inexpensive ingredients you most likely have on hand! Is your best bud infesting your house with fleas too? I hate it when that happen but it’s inevitable! Ever since I used this flea repellent for home I’m a lot more relaxed and opened about allowing our dog to spend time in the house with us (he’s more of an outdoorsy kind of guy now!). Ozzy is a super duper, hyper kind of dog, always so curious about every little thing around him so he loves to explore a lot! And one day, while sniffing this and that, he got real close to a big flock of sheep who turned out to be infested with fleas. Imagine the horror when he came back home! There were fleas everywhere and we only noticed it when he already got in the house and started scratching like it’s nobody’s business. My first urge was to run to the pet shop and buy something, anything! But then I calmed down and decided to take a natural approach instead of the “heavy duty” commercial solution, mainly because I love my doggy as much as I love my family. Since I would never expose my family to chemicals when there’s a natural, healthier solution, I thought the same should apply to our dog too. So before taking measures to deep lean my house and make a natural flea repellent for home, I made this natural flea repellent for our little guy. But for that to work at full capacity I had to apply the same method to our house and had to apply that magical flea repellent for home asap! Fleas love carpets and since doggy boy spent a pretty nice amount of time on the carpets around the house, rolling and scratching, there were fleas everywhere. Luckily we don’t have so many carpets so the cleaning wasn’t such a burden and my flea repellent proved to be a super powerful weapon. Do you need a flea repellent for home too? 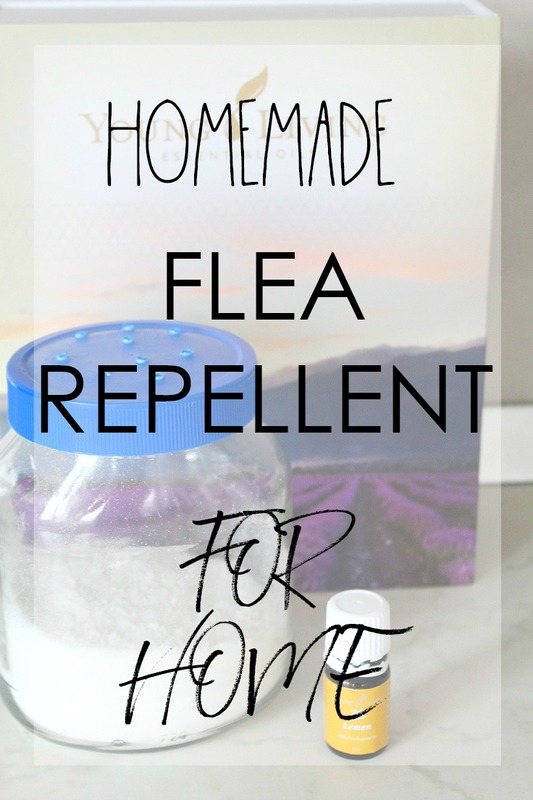 I totally recommend using this homemade home flea killer! It will not put your family at risk (although I recommend keeping an eye on small kids so they won’t touch or ingest this powder). And this flea repellent for home will have great, immediate results (well…within 24 hours). What’s in this natural flea repellent? 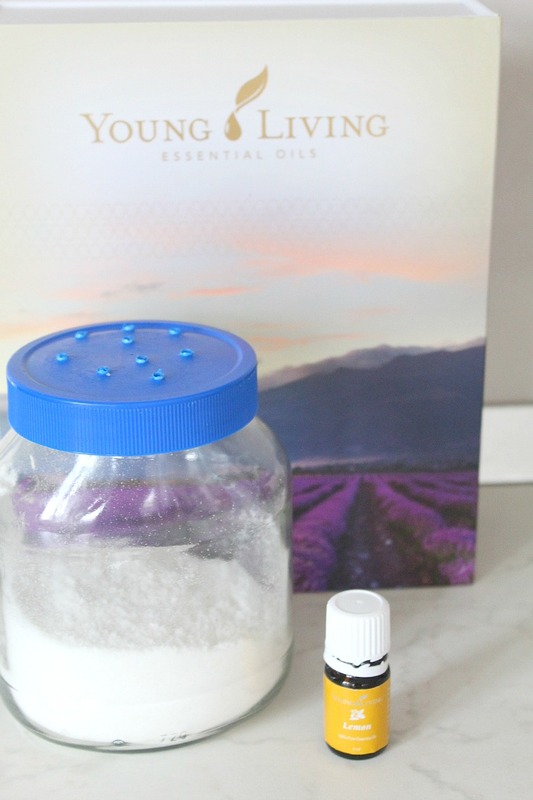 I used Borax, Baking soda, Salt and lemon essential oils from Young Living. 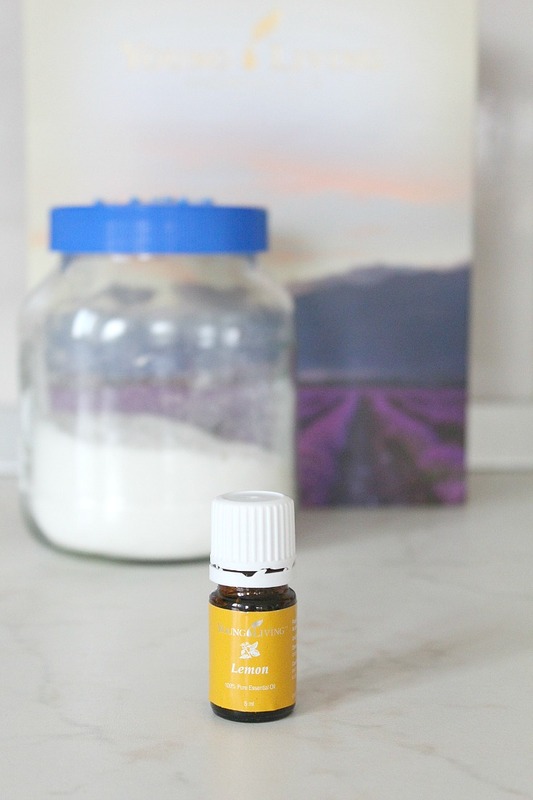 Borax and baking soda will kill the adult fleas, the salt will dry up the eggs and the essential oils will make your house smell absolutely divine! Plus if you use lemon or lavender scents, these are natural flea repellents so any possible unwanted visitors that you may have missed will stay away from your house. The best homemade flea killer ever! I sprinkled this flea repellent for home on all carpets and left it to work for 24 hours. I even sprinkled it on our mattress. After 24 hours, I vacuumed, threw the vacuum sack away and cleaned the furniture. Then I simply sprayed some of the dog natural flea repellent around the house without touching the furniture though. We got rid of all the fleas because we caught it on time and took immediate action. But if you are not as lucky, you may need to repeat the process at regular intervals. Not only am I suspicious of flea and tick medications, but they’re pricey too! Excited to find a healthy alternative! Glad you liked the idea, Hope! And thanks for commenting and rating this tutorial! I really hate fleas and this will add to my knowledge. Thanks for sharing! Hi Adreana. Thanks for stopping by! So happy I could help! I love EO’s, we put a few drops of citrus essential oils in our trash can’s and animals will stay out of them. Have sinus trouble in the winter so I boil some water and put a few drops of EO’s in the water and I can breath. Hello and Happy New Year to you. Borax is a poison to pets period. This is why the small amount used in commercial concoctions is to be applied to an area our pets cannot lick. Very back of neck where it joins the skull. No matter how obsessively we clean up the borax there will always be some residue left in the carpet or furniture material that will get on their paws and skin which they will then lick. This information is from vets and holistic pet healers for those who use Western meds and those who use Alternative meds. Borax is a toxin no getting around it. We pet lovers do not want to accidentally make our pets very ill. Happy New Year! If you would read the post, you’ll notice this is not used on pets or any other animals. It’s a flea repellent for HOME. You need to use Diatamacious earth it is food grade it is natural and the dogs or Kitty’s can lick it and its good for them . Farmers have been using this for years they put it in the food. It looks like flour. You can sprinkle it everywhere and you don’t have to worry about kids getting it in there mouths because its food grade it works great. Borax is VERY Harmful to your animals. Thanks, Cheri! My animals don’t lick the furniture, the carpets and the bed where I normally spread the mixture. I also have a 6 years old kid who’s the most reliable person I know, in spite of the small age. I found this is the easiest, most affordable and convenient solution and worked wonders in a matter of hours. Yes! I used this once and have not seen fleas in my living room since. It was a huge pain to get deep into the carpet fibers though. I used a broom and patted it in. I’d recommend a mask when using it too because it’s such a fine powder. It left the house pretty dusty even though I tried to be careful. Do you have any ideas on how else to apply it to carpets that isn’t such a pain? Thanks in advance. Hi Sheila. I have no tip to make the process easier, I’ve done some intense vacuuming to remove the powder from my carpets. Getting rid of all those nasty fleas was totally worth the effort! FOR THE FLEA REPELLANT, ARE THE OILS NECESSARY FOR FLEAS OR JUST TO MAKE HOUSE SMELL GOOD? What are the measurements of each item for the flea powder? Hi Kari. All measurements are specified in the recipe. Scroll through the whole article and click to page 2 where all the details are. I’ve read where borox is leathal to our dogs and cats. afraid to use this. So I will not have to lock my inside pets in another room for 24 hours? This would be awesome if that is the case. I really wanted to try it but was worried about my fur kids. No need to lock up your babies, Sonia. The article does mention putting the borax mixture on their dog. I’m not seeing the ratio to use for the borax, baking soda, salt, and lemon oil? You need to click to continue reading, it’s on the second page. Thanks for stopping by! Hi Debby. Thanks so much for stopping by. I hope the repellents will be as effective for you as they are for us. Thank you for sharing this!! We have been battling them pesky fleas no matter what we do. I will definitely try this out…thank you! How much of each do you mix? It’s all right in the article, David. You must have missed scrolling through and clicking to the second page.